WASHINGTON (AP) — A front-runner under attack from all sides, Republican Donald Trump demanded that his party's skeptical establishment embrace the inevitability of his presidential nomination as he stormed into Washington on Monday. Democrats responded by debuting a multi-pronged assault, shifting their rhetoric and resources against the man they expect to face in a contentious and ugly general election campaign. "If people want to be smart, they should embrace this movement," Trump declared at a news conference, shrugging off passionate resistance to his candidacy from both parties. "I'm an outsider," Trump said. "They're not used to this." As he often is, Trump was dogged by protests. A group of rabbis planned to boycott his evening speech to a pro-Israel lobbying group. Democratic presidential front-runner Hillary Clinton touched off her party's fresh anti-Trump campaign during a morning foreign policy speech to the American Israel Public Affairs Conference, questioning the former reality television star's readiness to guide the nation through delicate international entanglements. "We need steady hands," Clinton told thousands at the pro-Israel gathering. "Not a president who says he's neutral on Monday, pro-Israel on Tuesday and who-knows-what on Wednesday because everything's negotiable." Israel's security, she proclaimed, "is non-negotiable." Trump kindled criticism from Republicans as well as Democrats earlier in the year when he pledged to be "sort of a neutral guy" on Israel. While the U.S. is officially neutral in the Middle East conflict, his statement marked a rhetorical departure for U.S. presidential candidates. Clinton and her allies have readied a three-pronged effort against Trump that targets his character, credentials and controversial statements about women and minorities. That began in earnest on Monday, with labor unions, members of Congress and the presidential candidates all escalating their criticism. "Let's be honest — @realDonaldTrump is a loser," tweeted Sen. Elizabeth Warren, before launching into eight messages slamming Trump's "failed businesses," ''petty bullying" and "flagrant narcissism." The Massachusetts senator and liberal hero had largely stayed out of the presidential race, avoiding any endorsement of Clinton or her Democratic rival, Bernie Sanders. The harsh words came the day before Clinton is likely to extend her overwhelming delegate lead over Sanders in primary contests in Arizona, Utah and Idaho. On the Republican side, Trump's remaining rivals — Texas Sen. Ted Cruz and Ohio Gov. John Kasich — are fighting in Arizona and Utah to stop him from building an insurmountable lead as well. Cruz unveiled an endorsement from Utah Republican Gov. Gary Herbert, who declared in a state Capitol news conference that Cruz has the best chance to stop Trump. Kasich's campaign was promoting an endorsement from the GOP's 2012 nominee, Mitt Romney — although Romney only endorsed Kasich in Ohio. He's backing Cruz in Utah. Shortly after Clinton's speech, Trump huddled in Washington for a closed-door meeting with about two dozen Republican officials, many of them supporters. "It's obvious that Mr. Trump will be our nominee," said Rep. Chris Collins, one of two New York congressmen openly backing him. "We need to take the fight to Hillary Clinton." Added Rep. Scott DesJarlais of Tennessee: "People up here need to take a look at what's happening and probably get used to the idea that it's very likely Donald Trump will be our nominee." The New York real estate mogul was using a rare day in Washington to woo a Republican establishment that's been reluctant — and in some cases hell bent — on stopping his rise. Beyond mainstream Republicans, Trump also faces resistance from pro-Israel activists over what they consider a mixed record on the Middle East. 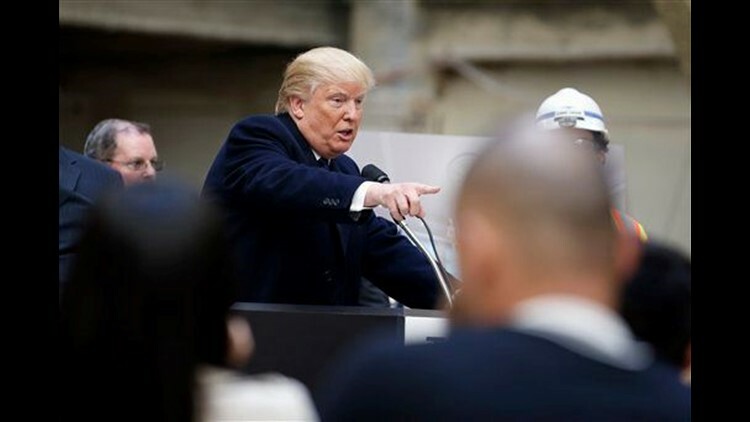 He has refused to make the perennial Republican campaign promise to move the U.S. Embassy from Tel Aviv to Jerusalem, drawing boos last year from the Republican Jewish Coalition. On Monday, Trump also appeared to break with decades of U.S. precedent on aid to Israel. When a reporter noted that Trump, in his rallies, frequently says that affluent countries that accept U.S. aid — like Germany and Japan — should return the funds. The Republican front-runner was then asked if that should apply to Israel. "I think Israel will do that also, yeah," Trump said, before easing back that statement minutes later. Besides his comments on Israel, socially liberal American Jews object to his controversial remarks about Mexican immigrants, women and Muslims, with some drawing analogies to the European persecution of Jews that eventually led to the Holocaust. Clinton drew a similar parallel, referencing a famous incident of a ship with Jewish refugees being turned away from the U.S. in 1939. "We've had dark chapters in our history before," she said. "America should be better than this, and I believe it's our responsibility as citizens to say so. If you see bigotry, oppose it." Trump, Cruz and Kasich were to address the pro-Israel group Monday evening. AP writers Andrew Taylor, Jill Colvin and Donna Cassata in Washington, Jonathan Lemire in New York and Nicholas Riccardi in Denver contributed to this report.